William Marland (1839 – 1905) was the oldest of the six Marland cousins, all grandsons of Andover industrialist Abraham Marland, who fought in the War. He was also one of the first residents of Andover to enlist, not waiting for the formation of the Andover Company, but joining instead the Massachusetts 6th Infantry for a three-month enlistment that many believed would be the entire duration of the conflict. The 6th regiment left immediately for Washington, but was attacked by a secessionist mob while changing trains in Baltimore. As a sergeant in the regiment’s color guard, Marland was struck by a thrown paving stone during the April 19 melee that is regarded as the War’s first engagement. 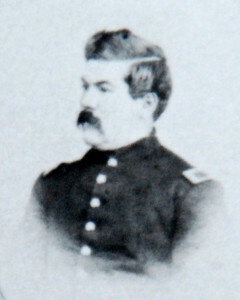 Marland served for the rest of the War in the 2nd Massachusetts Battery, moving through the ranks from 2nd lieutenant to Brevet Major by August 1865. He was awarded the Medal of Honor, the nation’s highest award for valor, for his bravery and daring leadership after his small unit was surrounded by rebel soldiers at Grand Coteau, Louisiana. After the war, Marland was appointed postmaster for the town of Andover and was active in town veteran’s affairs. He operated the popular, and reportedly rowdy, Phillips Academy “Commons” boarding house and eating club, and apparently grew cantankerous and controversial as he aged. He eventually retired, in search of a warmer climate, to Griffin, Georgia where he died at the age of sixty-six.